Surveillance tactics originally designed to combat terrorism have been used to spy on fishermen suspected of gathering shellfish in Poole Harbour. The Borough of Poole Council admitted using the powers under the Regulation of Investigatory Powers Act (RIPA). The council said it used covert surveillance to check for the illegal harvesting of cockles and clams. 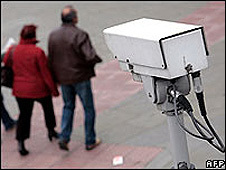 It has also used the powers to spy on a family to find out if they were really living in a school catchment area. The council has carried out surveillance on 17 occasions under RIPA since 2005, including monitoring suspected drug dealers and anti-social behaviour. Tim Martin, from the council, said: "The council uses legal powers to investigate and prosecute those individuals who attempt to break the law, damage our local communities or threaten Poole's natural environment." Council officers and other enforcement agencies carried out four snooping missions to monitor potentially illegal fishing activities in Poole Harbour. They remain the subject of continuing criminal investigations. Fishing for shellfish from Poole Harbour is banned by the Food Standards Agency because of pollution. Illegal shellfish dredging is also considered to be a public health risk if the fish stock is not fit for consumption. Do you know what they know about you?